The BFT VTM2 gate remote has 2 round green buttons in a silver or grey case and works on 315Mhz. 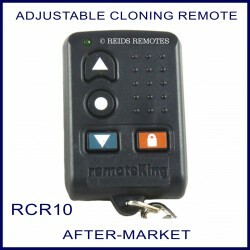 This remote is no longer available to order but it can be copied onto our generic cloning remote in store or onto the Multi 4 nose to nose cloning remote as long as you have a working remote. This silver or grey remote control has 2 round green buttons and used 10 dip switches internally to code to the gate or garage door. It operates on 315Mhz and is no longer available. If you have a working remote we can copy it for you in our shop or you can purchase a nose to nose cloning remote from the compatible items tab below. If you are not certain that the remote you have is compatible please feel free to email us a photo of the remote including the inside of the remote and we will be more than happy to help you work out which remote to purchase. The majority of fixed code remotes can be cloned onto a generic replacement or can be copied remote to remote using a nose to nose copy remote. 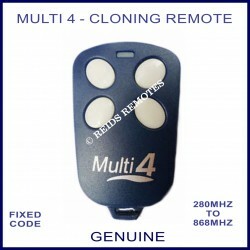 Once cloned the remote should work immediately as the receiver will recognize the new remote as being the same as the old working remote you cloned it from. All options for this remote are shown under the Compatible Items Tab. If you have any issues during cloning please call us and we will talk you through it.